The Westin Tampa Bay is #1...Again!!! 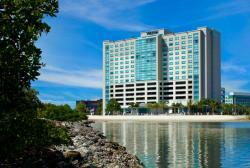 The Westin Tampa Bay was recently named the #1 Hotel in Tampa Bay by U.S. News, as they just released their 2013 Best Hotels listing. For the second year in a row The Westin Tampa Bay has been the recipient of this honor and it proves the theory that excellence is a habit! The doors opened back January of 2009, and this amazing new 244-room, AAA 4 Diamond award winning property hasn&apos;t looked back since, with a variety of updates to enhance its already amazing location located located on Rocky Point Island. With close proximity to Tampa International Airport, nearby shopping & entertainment and easy access to downtown Tampa, you can see why the Westin Tampa Bay is ranked consistently amongst Tampa Bay&apos;s accommodation elite. The Westin Tampa Bay is also home to one of the area&apos;s most picturesque waterfront dining locations. At Aqua Restaurant Bar & Lounge, experience an environment designed to entertain your every sense, highlighted by a water encased walk-in wine cellar and a state of the art open kitchen. Whether you are looking to host a meeting/event, enjoy a weekend getaway with a loved one, or sample fine culinary delights, be sure to check out the Westin Tampa Bay!